This episode of The Voice PH started with making a quick recap on what happened last week. Remembering about what took place last week, we can think of a showcase of different talents with different virtues they believed in. This episode has a lot to offer to the total viewing of the people. The show started with a pastor’s kid named Jireh Singson’s performance of the song “Makita Kang Muli” that convinced coaches Apl.de.ap and Sarah turn their chairs. Jireh preferred joining Coach Sarah’s team. The second performer was Abbey Pineda who happened to have the same family name with Coach Apl.de.ap. She was 33 years old and she performed the song “I Just Can’t Stop Loving You” by Michael Jackson. Abbey’s performance made Coach Apl turn his char making him her coach. Rita Martinez, 30 years old was the third performer who grew up in a business-minded family. Rita sang the rock song “Sweet Child O’ Mine” that made Coach Bamboo turn his chair. Another artist who made it to the competition was a virtual assistant named Karl Tanhueco from Pampanga. He sang the song “All of Me” that blew Coach Lea’s mind. There was a duo that performed “Sinong Baliw” from Bacolod City but did not advance in the competition. The two were Nena Joy Zamora and Shekinah Anzano, both from Bacolod City. A girl named Rosalyn Navarro was the next artist who performed who made coaches Apl.de.ap and Sarah push the red button to make their chairs turn. She performed the song “Get Here.” Rosalyn chose Coach Sarah to be her mentor. Daryl Ong, an animator from Quezon City did his best that resulted to convincing three coaches to turn their chairs. He sang the song “Paano” excellently and chose Coach Apl.de.ap to be his mentor. Before giving the last performer in the episode of The Voice of the Philippines Season 2, there was a quick recap of those who did not make it to any of the teams. The last performer was Rizza Cabrera who completed Team Sarah. She sang the song “Clarity” while playing guitar. 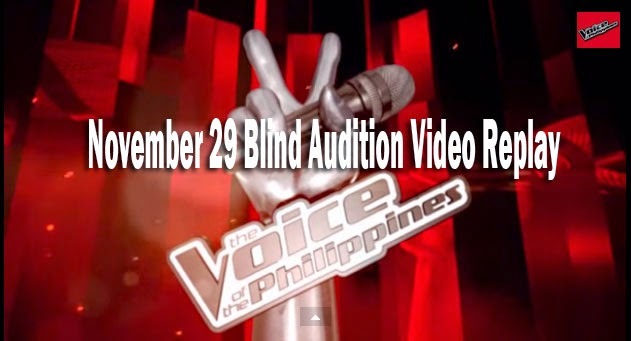 Bookmark and reload this page from time to time to see live update of The Voice of the Philippines Season 2 November 29, 2014 Blind Audition. Follow us on Facebook and Twitter.